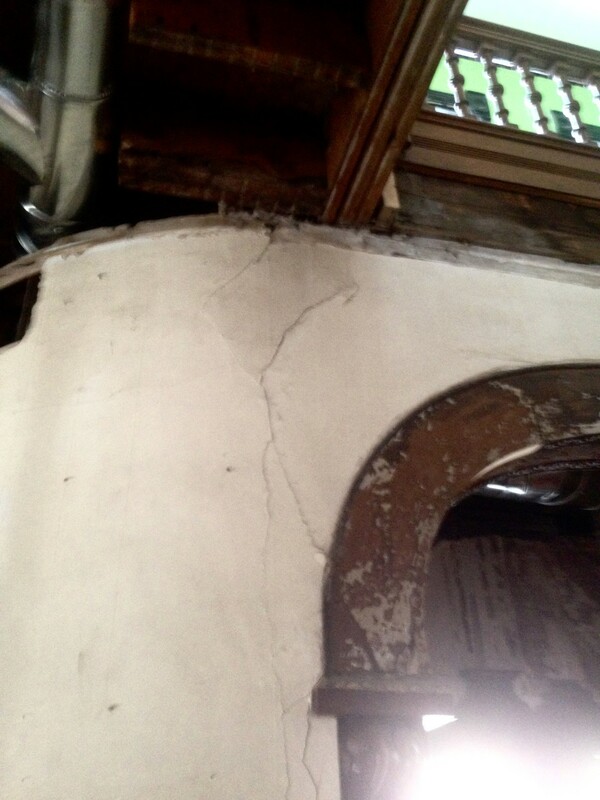 If you buy an old house, EXPECT to discover at least six structural issues. And be calm. But, if you find a seventh issue, GIVE THE HOUSE BACK TO THE PREVIOUS OWNER. The point of The Rule is that all old houses have structural issues. Expect them. Do not be surprised. Be calm. But if you hit Issue #7? RUN FOR YOUR LIFE! The south exterior kitchen wall was virtual. There was so much water and termite damage that the wall came apart by hand. No crowbars were required. The east kitchen exterior wall had no foundation under it. I am serious. It never did have a foundation under it. Even though the second-floor and roof rested on this wall. The west exterior wall, centering on the bay window in the parlor, was also unsupported. The second floor and roof were just sitting on the cantilevered parlor bay, with no beam under. Oh. My. The four-story servant’s stair is kinda like a tower in the NE corner. But this tower is being pushed AWAY from the house by the thrust of the massive roof. Oh. Dear. In the two-story stair hall there is deliriously wacky original framing, which over the last 122-years has caused all kinds of havoc. The upper landing of the staircase is sagging. I have now owned the house two years. And discovered SIX structural issues. So I am just a single issue from handing the house back to the previous owner! Luckily, I am pretty sure I have found all the issues. Pray that this stays a trueism. The is the second-floor landing of the house. The top of the drawing is north. The #1 arrow points to a beam. The beam is 22-feet-long. It holds up the landing. There is no wall under the beam. The #2 arrow points to a wall. This wall sits on floor joists running east/west. These joists end at the 22-foot-long beam. The wall has NO wall under it. Again, the wall just sits on the floor, and the floor is held aloft by the long beam over to the east. In short, what the above caption is saying is: Eek. BIG FRIGGIN’ EEK! A 22-foot-long beam, made out of three 2x12s, is just too long. Then to load multiple floor joists, running at a right angle from the beam, onto an already overloaded beam is, well, bad. Very bad. Then to load a wall on top of overloaded joists AND an over-loaded beam is very very very bad. To compound this structural horror story, in 1929 two kitchens and another wall were loaded onto the overloaded beam and overloaded joists. Just writing all this makes my heart stop. Over the last 122-years the beam sagged, quite understandably (really, I am sympathetic), by 2.5 inches. This sag also dragged down the joists. And the weight of the wall also caused the joists to sag. To make matters even worse, the north side of the house has settled 2-inches. This means that the north end of the beam is now 2-inches lower than its other end, 22-feet to the south. The result of all this, a condition stewing for 122-years, was an obviously sagging floor, a sagging stair balustrade, two crooked door frames, and a great many cracks in the plaster. In short? A stairhall which looked drunk. This structural mess is also ongoing, meaning that I could reset the door frames so they were level, repair all the cracks in the plaster walls, and the problems would just manifest all over again in time. When I purchased the house the very first thing I did was to remove the 1929 wall. This removed some weight from the sagging beam. But the beam still sagged. And a 22-foot beam, sagging for 122-years, does not un-sag. No, it will remain sagging no matter what. Unless you cut right through it. This of course wholly, and in an instant, destroyed ALL structural integrity. So, yea, eek. But it had to be done. You are standing on the first-floor, facing west and the front doors, and looking up to the second-floor. See The Beam, with the attached 2x4s? It is 22-feet long, and is supporting A) the upper landing and B) all The Joists running at a right-angle, and C) The Wall. While you cannot see the sags in The Beam and The Joists in this image (evident in person), you can see the droopy door frame. At the top of the image is The Beam. We ruthlessly cut right through it. 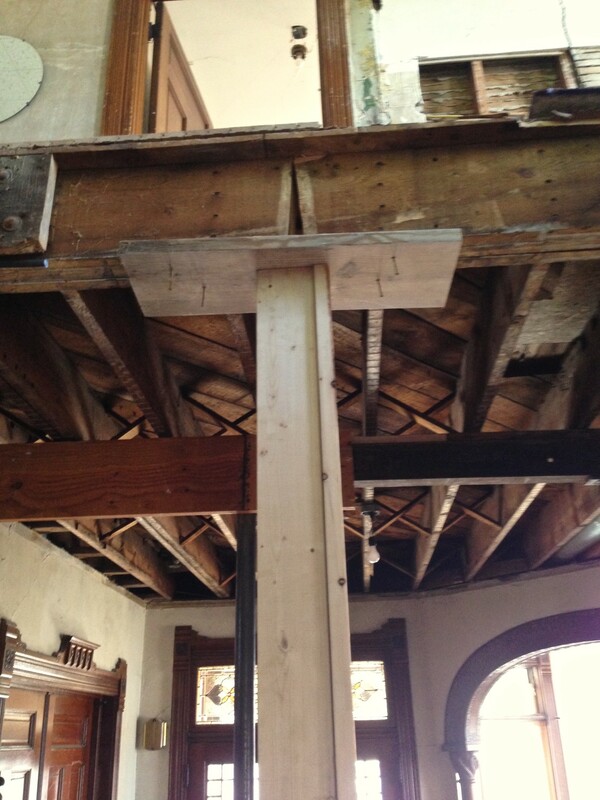 To keep the entire house from collapsing into a pile, we temporarily supported the beam with a column. Then we jacked up the beam so it no longer sagged. It is however still not level, but unless I jack up the entire north side of the house, I cannot not make it level. So, I am at least grateful it is no longer sagging. NOTE: You can see The Joists running at a right angle to The Beam. NOTE: you are looking west. You are now looking east. See the temporary column holding up The Beam? See The Joists? The latter are temporarily being supported by a steel beam and two temporary black columns. I suspect that Susan Cross, when she moved into her grand new home in 1894, could never have envisioned such a scene. The sag in The Beam was crushing a curved wall on the north end of the stairhall. Even if I repaired the cracked plaster, it would crack again, unless the cause of the cracking was fixed. The guys. In the middle is Justin. He is the main contractor working on the Cross House. Jeremy is to the right; Sergio to the left. I love these guys. The guys are installed a new beam under The Wall. This New Beam will supplant the load previously carried, poorly, by The Beam. Following all this? The New Beam is directly under The Wall, and will assure that The Wall and The Joists (which we had the cut through to un-sag them) never sag again. 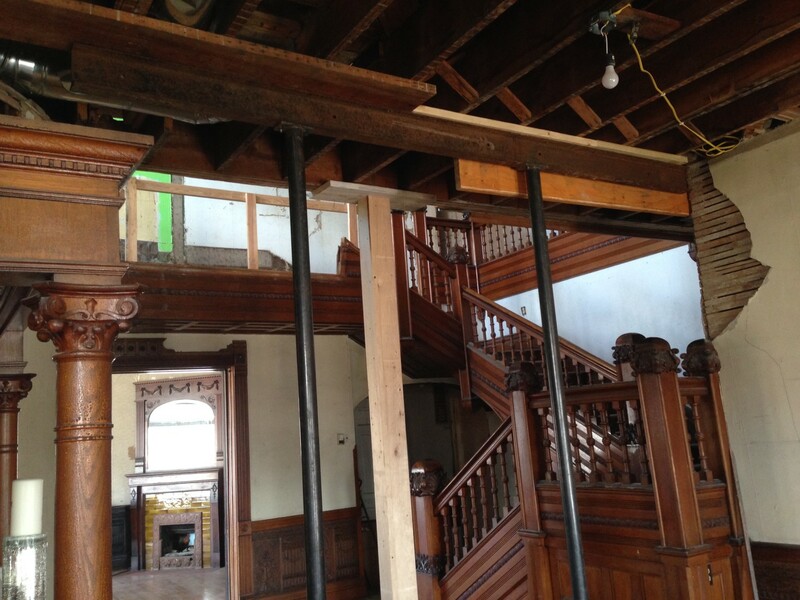 The New Beam will be covered over in oak, detailed to match the original stair detailing, as seen in the upper left. 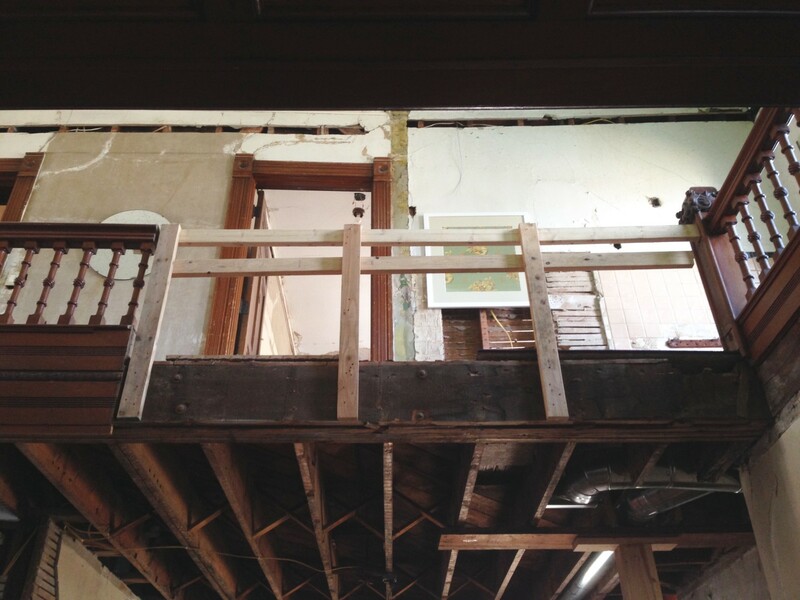 When all is done, the New Beam will appear original, and will actually help to better define the first-floor space, creating a distinct foyer and stairhall, rather than one large ill-defined space as has existed for 122-years. NOTE: The Beam has now been un-sagged, a new 2×12 has been bolted through to restore structural integrity, and the temporary column removed. I designed all this structural rejiggering, and have an odd talent for such work. It must be a past life thing. Yesterday, Justin and I spent two hours with a laser level (coolest invention ever!) 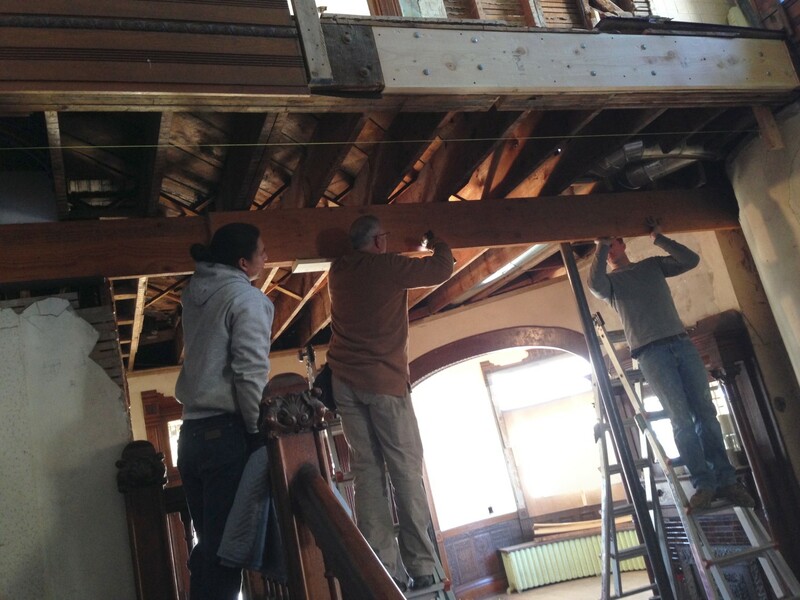 working to determine just what the hell was going on with all this sagging and overloaded beams/joists. It was during this meeting when we discovered that the whole north side of the house had sunk by 2-inches (which means that in China there is, presumably, a corresponding slight bump in the ground). The meeting was a lot of fun. It is odd, I admit, what I find enjoyable. 18 Responses to The DREADED Six Rule! 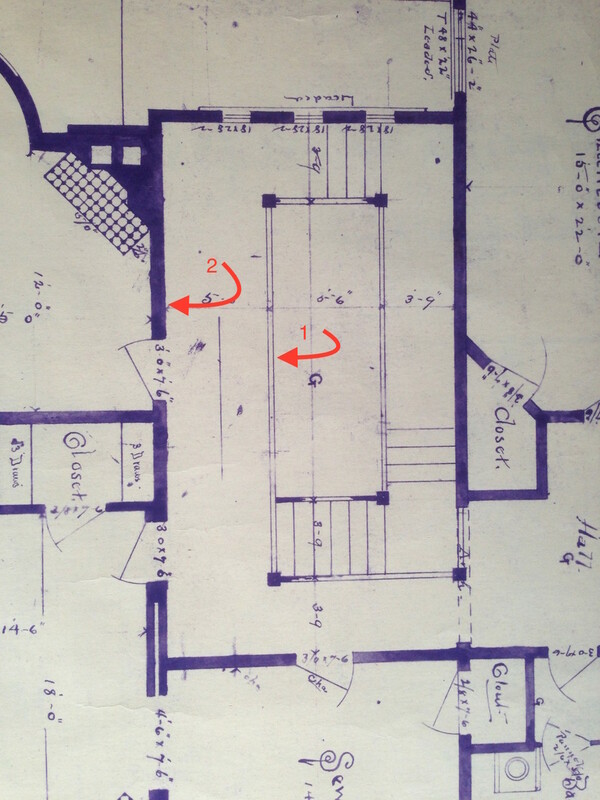 So, was this flaw in the blue prints, with the carpenters asking wtf? and being told they weren’t hired to question the design? Were corners cut? Was there that much faith in the strength of the wood and so little experience in building mansions with it? What on earth? I am sure all this followed the drawings. And no corners were cut. MAYBE had the 1929 work not been loaded onto the beam/joists, all MIGHT have been OK. While millwork and finish carpentry have definitely declined in the last 100 years, structural knowledge has increased greatly. Most wood structures 100 years ago were designed based on basic engineering principles, but largely applied by empirical “rules of thumb” and what the designer felt had worked in the past. Standard low-rise wood-frame construction is still done according to this method (largely by tables in the International Residential Code), but special situations are required to have an engineered analysis and design. These are the situations where old structures are less predicable, as it was far less likely that a capable engineer did a proper calculation of loads and sized appropriate members. In addition to that, our materiel capacities are more predicable now. That makes sense. I guess I figured the architect had some engineering background. WOW! Just WOW! I will have to re-read and examine the photos tomorrow to try to truly understand…but WOW! You are AMAZING Ross! It really is hard to take it all in! I tried to make it as understandable as possible but thought: People are just going to give up half-way reading this! And run for a glass of wine! The house is just lucky you and the guys didn’t give up and run for the wine. Great work, Ross, and team! Wow – smart solutions to the structural issue – well done! You do have a talent for all this, dear Ross. Forge on! We’re still in snow up here in northern MN…I am yearning for Spring. So if you do find a 7th structural issue I’m sure you’ll decide you’re too far into all this to give the house back to the bank at that point. No, no! It is an ABSOLUTE RULE! If I hit #7…BACK TO THE BANK THE HOUSE GOES! I will then go buy something sensible! You should be the author of Cents and Centsabilities, The Diary of A True Victorian Restoration. We can all be thankful that your Victorian lady was lucky to have picked you as her owner and benefactor. Great job you guys. Hello from West Texas. I discovered your blog through your circa old house interview. I was hooked from your first post. I read until my eyeballs hurt every evening and have finally caught up reading about your amazing restoration adventure. You are living my dream! Fortunately West Texas dosen’t have any Victorian homes so II can’t restore one. That’s OK…I have found you so I will look forward to your posts and share in your journey. Soooo…. if this serious defect in design is obvious, it kinda makes the issue with the stairs make a little more sense. The drawn design was not really all that good. The stairs might have become an obvious issue that they remedied during construction. It kind of makes me wonder if Squires’ expertise was designing but, like Frank Lloyd Wright, he wasn’t good on what happens to big houses over time. Wright’s houses had structural integrity for now and 10 years from now but all his unusual designs like Fallingwater and the textile block houses in California have fallen apart in a pretty dramatic and expensive way. Given that Squires designed so many houses in Emporia, it might be interesting in your spare time (that’s a joke) to visit a few and see if they have the same lack of structural integrity as yours. It looks like it’s just luck and the fact that they built with rough better lumber 100 years ago that the Cross house hasn’t had some major major internal collapse. I have all my stuff stored in a mill that was built in 1862 in North Vassalboro, Maine. It is 50 X 150 feet. The 50 part is one beam 12 X 12 X 50 feet long (ask for that at Home Depot) supported in the middle by one 10 inch wood post. It’s 5 stories high and gives new meaning to the word “sag”. What’s holding it up I’m not exactly sure. Impressive repair work! Our house has some slight differential settlement and creep deformation in some beams, but none severe enough to warrant jacking.